Apple on Thursday provided developers with a prerelease version of its forthcoming iOS 6.1 update, featuring improvements to its Maps application programming interface, and also issued a beta of Xcode 4.6. Both iOS 6.1 and Xcode 4.6 are now available to download from Apple's developer website. 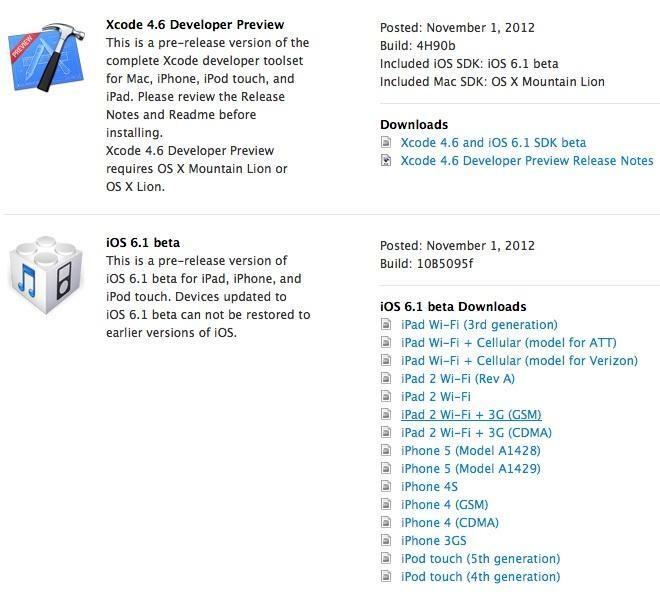 People familiar with the first iOS 6.1 beta indicated it is identified as "Build 10B5095f." The iOS 6.1 beta is available for the iPhone 5, iPhone 4S, iPhone 4 and iPhone 3GS; fourth-, third- and second-generation iPads; and the fifth- and fourth-generation iPod touch. Beta versions of iOS 6.1 compatible with the iPad mini and new fourth-generation iPad, which will become publicly available tomorrow, are not said to be offered on Apple's developer website. The only major new addition to iOS 6.1 is said to be "Map Kit Searches" as part of the "Map Kit" framework. It now lets developers search for map-based addresses and points of interest. A new class labeled "MKLocalSearch" is also said to offer map-based content using a natural language string. This will allow users to enter place name information or portions of an address to return relevant information. In one example provided to developers, users could search the string "coffee," and it would return the location of local coffee bars along with information about each one. The new Xcode 4.6 beta is reportedly labeled as "Build 4H90b," and it includes the iOS 6.1 beta SDK, along with Mac OS X 10.8 SDK. The pre-release version of Xcode includes the Xcode IDE, iOS simulator, and all required tools and frameworks for building OS X and iOS applications.